I'm pleased with how it's going. The yarn is Sirdar Country Style DK, and the colour is probably closest to the photo below. 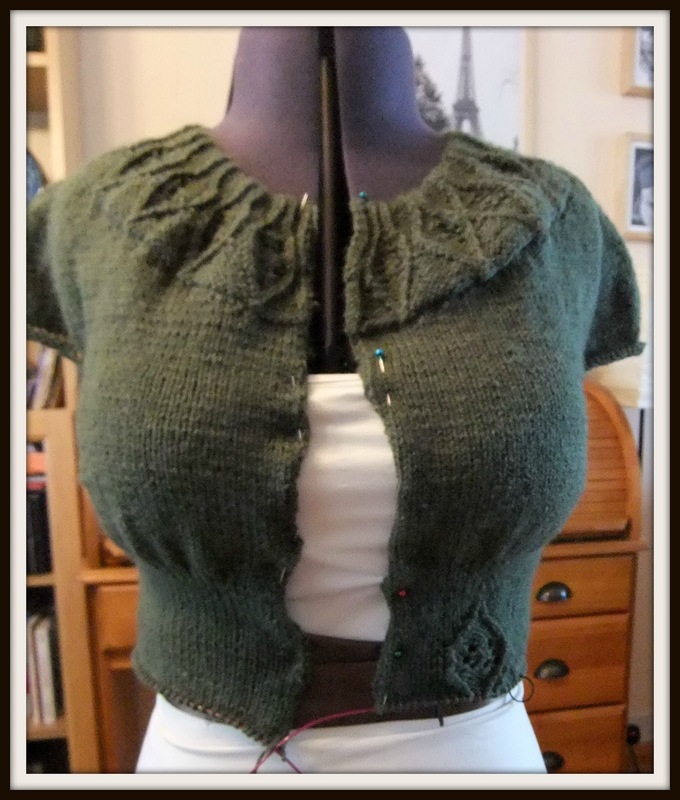 I'm making size 32 with short-row shaping for the bust. I also had to go down to 3mm needles to get the right tension. 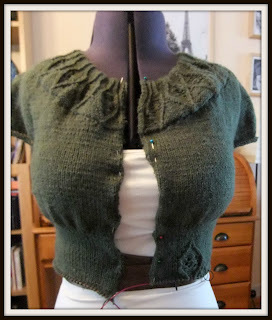 This is a top-down cardigan, and the pattern is beautifully written. It starts off with the leaf design on the collar, then the front and back neck and sleeve tops are shaped using short rows. 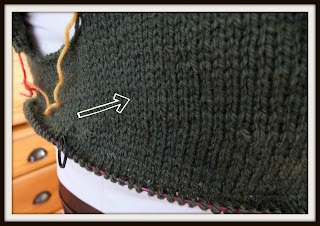 This confused me a bit because it's not Wrap and Turn short rows, but SSK and K2TOG short rows as on a sock heel. But I trusted the pattern, and once I started it, it began to make sense. The photo below shows the end of this short row section. You can see that the neck front will now sit lower that the neck back - it's very clever!! It also includes slight puffiness at the top of the sleeves, which I love! I've tried to show it in the photo below, but I'm not sure how well it shows up. To try and make a bit of sense of it, the bit between the two round black stitch markers is the sleeve (apologies if that is obvious! 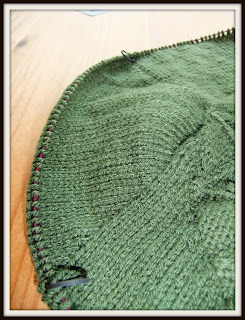 ), and the raglan increases are included in the shaping. I included some Wrap and Turn short-row shaping at the bust. This isn't completely necessary, it just depends on the shape of the wearer. For Readers who are sewists and not knitters, this is the knitting equivalent of a Full Bust Adjustment, where extra room is added to a bust dart to accommodate a larger bust. Thankfully Ysolda explains all this in the book, and also handily includes the calculations so you can work out the hows and where's. Yey!! 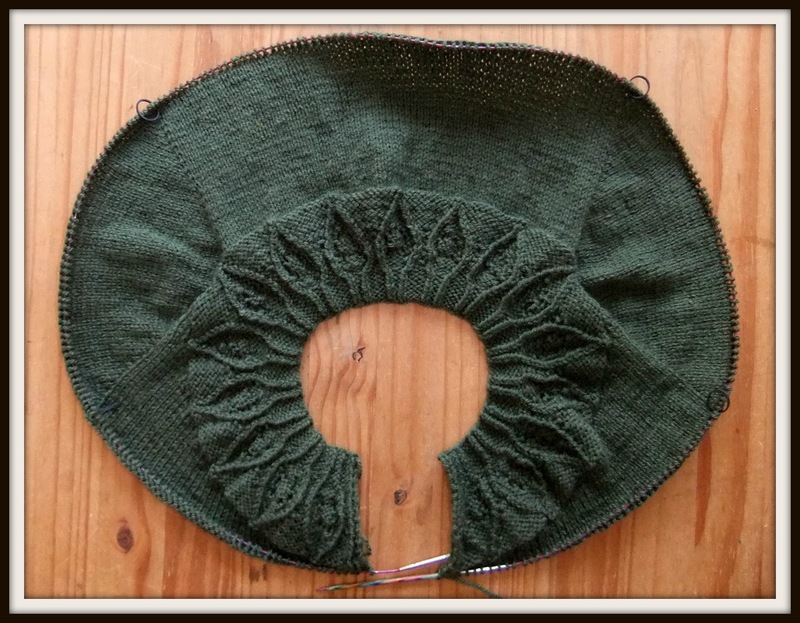 Below is a photo of the finished Short-Row shaping. I know it's pretty difficult to see; the little arrow is pointing in the direction that it is going. 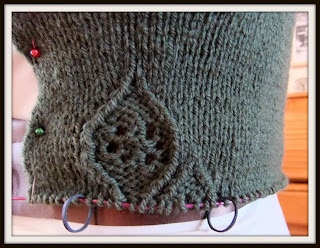 The leaf design at the neck is also added on one side of the waist, and I am half way through it at the minute. In sewing news, I am half way through Alma No3, but I am impatiently waiting for some black satin bias tape I ordered on ebay to edge the neck facing. So now I may start another Madeleine Skirt, or do a bit more of my cardigan. I have seen some lovely versions of this on Ravelry. Yours is looking great. I like the way Isolda gives help with sizing and alterations. Thank you! The help on the pattern (and in the book) definately make it easier to knit.